The judging of this year’s Feltmaker’s Design Award took place on 3rd. April at Haberdashers Hall. 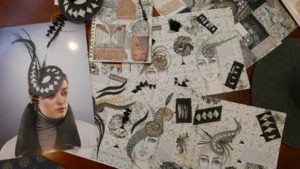 Entries for the competition are invited from fashion students and employees of a trainee or apprentice status. Designs from new start up businesses are also welcome. 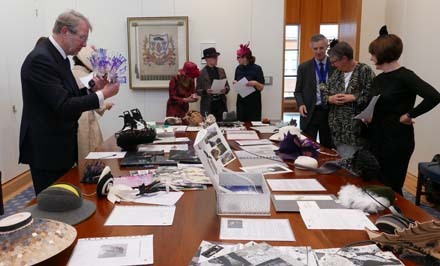 This year’s entries did not disappoint: there were over 40 hats from different colleges from both the UK and Europe. We were very grateful to the fantastic judging panel who very kindly gave up their time to share their expertise. 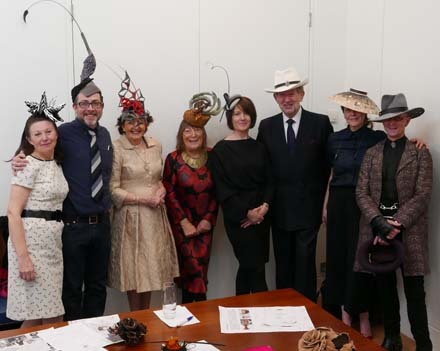 The panel comprised Hilary Alexander OBE, freelance fashion writer, Carole Denford, editor of the Hat Magazine, milliners Edwina Ibbotson, Piers Atkinson and Eda Rose-Lawson, along with William Horsman – retired hat manufacturer. 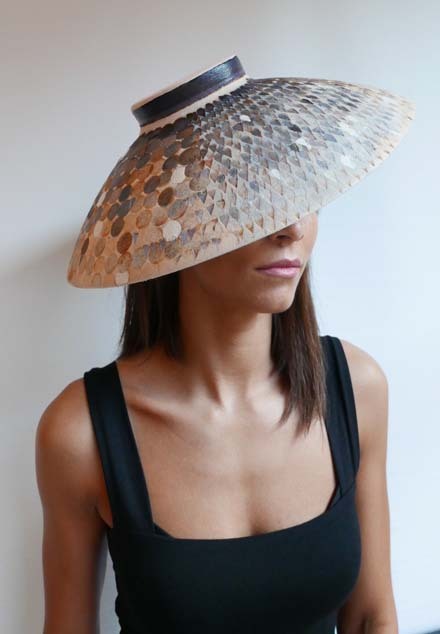 Also on the panel were the competition organisers – milliner Rachel Trevor-Morgan and Ian Wright, hat manufacturer. We were pleased to be joined by the Master, Jeremy Brassington and his wife, Pearl, who welcomed The Lady Mayoress, Mrs Wendy Parmley and the wives of the two Sheriffs, Mrs Hilary Russell and Mrs Lindy Estlin. It was a great pleasure to have them there to witness the discussion and final judging. First Prize of £1,200 was awarded to Alexandra Thompson from Kensington and Chelsea College for her subtly elegant ‘upturned bowl’ design. The symmetrical wide-brimmed hat was immaculately blocked in an ivory fur felt with a shallow, round, indented crown. The textile patterning, which continued under the brim, intrigued all judges. The supporting paperwork revealed the patterns had been made by a series of tiny irons used to singe the felt with repeated marks, some of which were then coated in an enamel paint to simulate the glaze designs in pottery; the starting point of this design. 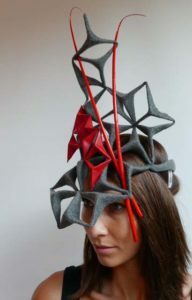 Second Prize of £600 went to Maria Tzorpatzoglou Kinickon for her dramatic Minoan headdress, a grand affair with regal overtones in black and gold, using a combination of materials and techniques. Felt formed the base, with a tapestry overlay, wired ‘wings’ and symmetrical flourishes of black feathers. The design sits quite forward on the forehead in a central position and creates a dramatic silhouette. Third Prize of £450 went to Clare Spicer from Morley College. Clare designed a stunning felt creation reminiscent of carved, rococo mouldings from an early 17th Century English interior – the research showed the inspiration was an over-door surround by the celebrated Grinling Gibbons. The hat itself was a classic pillbox, beautifully blocked. The trim, however, was the winning element. A garland of rustic elements encircled the hat in a festoon of oak and ivy leaves, roses, acorns and, wonderfully, peas in their pods – all immaculately crafted from fur felt embellished with tiny stitches forming the veins in the leaves. The use of chocolate and tan felts to convey its hand-carved, wooden origins. complexity of the structure, and the immaculate finish ensured Jude’s well-deserved award. The Commercial Appeal prize (£200) went to Marell Kull. 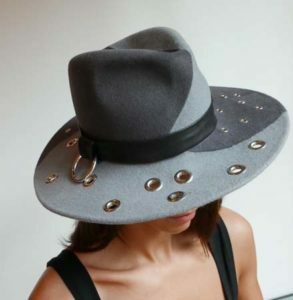 This was an easy-to-wear classic fedora design but cleverly blocked from two different shades of grey and invisibly stitched together, edge to edge, in a dynamic curve. In addition the brim was perforated with large chrome eyelets which were echoed in the headband with a chrome ring feature. The classic shape and colour offset by the Rock n’ Roll detailing meant that this was a confident commercial winner. 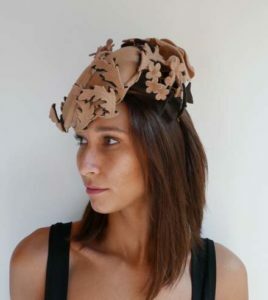 The Innovative Use of Felt prize (£200) was awarded to Teresa Rodriguez from Kensington and Chelsea College for her trompe l’oeil bronze butterfly hat. 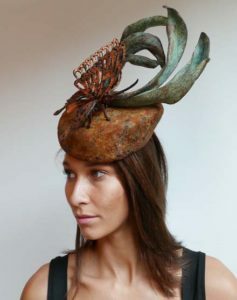 With a variety of finishes and processes, Teresa cunningly transformed a light-weight felt hat into an apparent bronze and copper sculpture. Verdigris and rust covered this teardrop design including a lace-winged butterfly and upturned sweeps of leaves, balancing the mint and umber hues to great effect in this gravity defying style! The Artwork and Presentation prize (£200) went to to Sarra Haji from Northampton College, for her multi-layered presentation boards showing her entire process from inspiration to technique tests and designs. The boards were backed with a tessellated design based on Islamic tiles. There were a variety of fashion illustrations showing design permutations and tests of various trimming techniques – all of which revealed an investigative and aesthetic design-base from which her beautiful, calligraphic ‘Arabesque’ felt swirl hat was created. The judging was followed by a delicious lunch with all present. Many thanks to Haberdashers Hall for the smooth running of the day and to our model, Mica, and Carole Denford for the photography.